To many, Marie Aull was the godmother of the environmental movement in southwestern Ohio. As both a conservationist and gardener, she loved Dayton and its natural beauty, and she devoted her life to preserving it. Visitors to her former country garden retreat can enjoy the collection of wildflowers, beautiful gardens and natural areas she and her husband, John, worked for years to curate. Adult groups may schedule guided and self-guided walking tours. Call 937-275-PARK (7275) to schedule. The diverse habitats of this intimate park along Wiles Creek make it a great place for nature study, discovering shade gardening, birding, relaxing and observing butterflies. Through the years, the Aulls interlaced wildflowers around their property. Today, something is in flower most of the year, with spring showcasing masses of daffodils and Virginia bluebells, followed by the fragrant and floriferous Lilac Lawn in May and red buds and peonies in June. The prairie and the butterfly garden are best in July, and then in August the magic lilies among ostrich ferns, Colchicum (some species until October) and hardy begonia bloom until fall. Even in winter there is something to see with witch hazel and lenten roses scattered about this special place. The park has a mile-long garden path for walking through gardens, woods and a prairie. The trail is a combination of grass, gravel, soil and pavement. 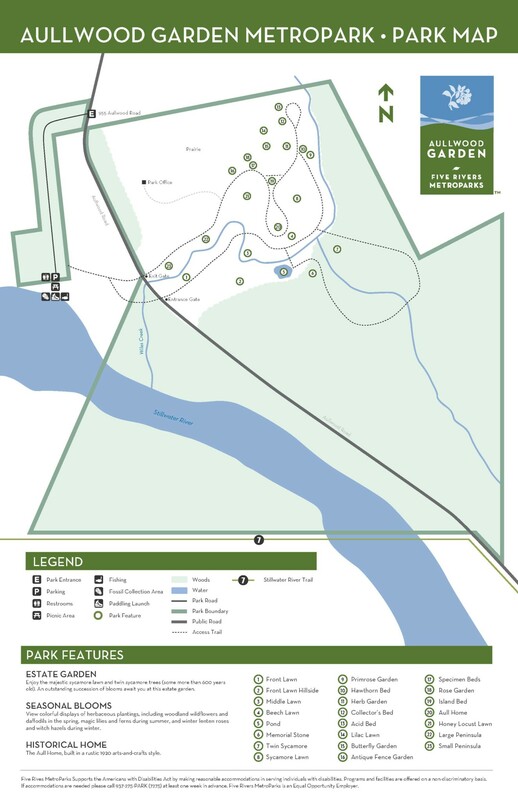 There is a trail connection to the South Park of Englewood MetroPark and to the Aullwood Audubon Center and Farm. This woodland garden and home date to 1907 and are on both the Ohio State and National Historic Registries. The Aull house, built in a rustic 1920 Arts and Crafts style, is open occasionally for tours. The rock work is currently being restored along Wiles Creek, which meanders throughout the grounds. This native prairie is home to many birds and other wildlife. It’s a great place to watch nesting bluebirds, indigo buntings, gold finches and song sparrows. Walk among the flowers and watch butterflies, hummingbirds and hummingbird moths as they sip nectar. At the back of the garden is the district’s 8th largest tree, a 600-year-old twin sycamore named “Marie’s Sycamore,” which was alive when Christopher Columbus discovered America in 1492. It has a circumference of 197 inches and stands 31 feet tall. (Total Points: 315). Near this Sycamore stands “Big Blue,” a Blue Ash tree that stands 127 feet tall. The nature trail through the park is a combination of grass, gravel, soil and pavement. It is flat, but not ideal for wheelchairs. Call (937) 275-PARK (7275) if you need special access Monday through Friday, from 8 AM to 4 PM or during public programs. There is one accessible port-a-john at the accessible parking lot. The house is not open to the public and is not ADA accessible. The path from the parking lot to the garden entrance is accessible (packed limestone). Gently rolling paths beyond the entrance and natural surface trails limit ADA accessibility. The trail surfaces include: gravel, grass, soil and chip and seal. No snow removal in winter. There are six park benches along the path in the garden areas. Visitors needing solid surface can enter the “out” entrance at Aullwood Road and go up to the house and herb garden via the former driveway. The grade is steep. There is one accessible portable toilet at the parking lot. Marie S. Aull (1897-2002) has been called the godmother of the environmental movement in the Miami Valley. Along with her husband, John, Ms. Aull nurtured the woodland bordering the Stillwater River into a beautiful, peaceful landscape of flowers, streams and natural growth. Marie Aull’s vision for preserving green space and educating the public about the conservation movement also extended to playing key roles in the founding of the MetroParks. MetroParks takes exceptional care to maintain the blooms to the Aulls’ standards. Staff and volunteers work diligently to keep the garden free from invasive species and wildlife that see the garden plants as food. Note the tall deer fence around the park, designed to keep the white-tailed deer out of the garden. John Aull once said, “Remember, we hold this land in trust to be passed on to future generations as beautiful as we found it.” Both John and Marie held this as a founding principle for all of their generosity and conservation efforts. At the back of the garden is the district’s 8th largest tree, a 600-year-old twin Sycamore named “Marie’s Sycamore” that was alive when Christopher Columbus came to America in 1492. It has a circumference of 197 inches and stands 31 feet tall. (Total Points: 315). Near this Sycamore stands “Big Blue,” a blue ash tree standing 127 feet tall. Walk among the flowers and watch butterflies, hummingbirds and hummingbird moths as they sip nectar. The adjacent native prairie is a great place to watch nesting bluebirds, indigo buntings, gold finches and song sparrows. Check the kiosk as you enter the garden for a list of the plants that are currently in-bloom. An outstanding succession of blooms awaits you at this estate garden. View colorful displays of herbaceous plantings, including woodland wildflowers and daffodils in the spring, magic lilies and ferns during summer and winter lenten roses and witch hazels during winter. The garden acquired its present configuration in the two decades following John and Marie’s marriage in 1923. From the beginning, Wiles Creek served as a landscape focus and the forest shade determined the selection of plants. Tens of thousands of Virginia bluebells that now cover the hillsides in late April are the progeny of 200 plants they purchased in 1928. At the woodland garden’s center, you view John and Marie Aull’s home of many years. The gardens surrounding it were deeply personal to them. For decades, they planted the forebears of many of the flowers you see there today. When you experience the splendor of their labor you easily understand why the Aulls loved this place so fiercely and wanted to share it with others during their lifetimes and beyond. Old-growth trees tower gracefully over the spacious beds of wild and cultivated flowers. This country garden and home date to 1907 and are on the Ohio State and National Historic Registries. The Aull house, built in a rustic 1920 Arts and Crafts style, is open occasionally for tours. The rock work is being restored along Wiles Creek, which meanders throughout the grounds. The exposed limestone on the banks of the Stillwater River and fossil imprints tell an earlier history of the Aullwood land, which is 450 million years old, where Native Americans once walked and where a pioneer village stood nearby before 1795. Stroll through this historical garden park, where something is in flower most of the year, from wildflowers to lenten roses in early spring to magic lilies and Colchicum into the fall. The grass, gravel, soil or paved paths travel through gardens, woods and a prairie in just one-half mile. In addition to the famous garden, this park boasts a high-quality mature forest containing outstanding examples of native trees, plants and forest wildlife. A small, planted prairie gives a glimpse of native grassland habitat. Aullwood is also a popular birding location. There’s always something in bloom somewhere in the garden. As some plants and flowers wane, others come into bloom and color. The various specialty plantings provide ideal spaces for capturing the beauty of plants and native wildlife through the camera’s eye. You might even get some garden ideas for your own yard! Help maintain the unique gardens and historical home at Aullwood Garden MetroPark by becoming a volunteer. Opportunities include gardening, garden tour guides, photography, plant identification, history research and invasive plant removal. For decades, this living work of art has touched visitors emotionally and spiritually with its diversity and abundance of floral displays, towering trees and serenity. The 31-acre park has a picturesque creek, a prairie, woods and gardens planted with native and cultivated flowers.